Indoor seed starts, plus extra credit for everyone! (Part 6) - Perelandra Ltd.
Plus an "Extra Credit" Assignment! Some of you will be starting seeds and plants indoors or in a greenhouse this month or next. It's time to get the information for that! Can you even offer to start seeds early indoors? Do you have a place to do this? Do you have time to tend to the seedlings? If you know right now that you will not be starting any seeds indoors for your garden, skip to your "extra credit" assignment below. First, re-read the two paragraphs on page 25 of the Garden Workbook, "Moving on from here in partnership." Next, read from the last paragraph of page 144, "The #1 Important Decision," through the first paragraph on page 145. Then return to this email. 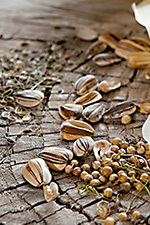 Now that you've answered those questions, hit the start button and tell nature what you have to offer for seed starting. This is absolutely critical. Don't skip this. Those pages will give you the questions to ask. Instead of PKTT (kinesiology testing), you'll be getting your answers from nature in other ways — through your gut instinct or hints that appear as you go through your days this week. First, read from the last paragraph of page 144, "The #1 Important Decision," through the first paragraph on page 145. Then return to this email. Not starting seeds indoors? Well, we have something for you too. And if you indoor-seed-starters are feeling ambitious, you're welcome to enjoy this as well! 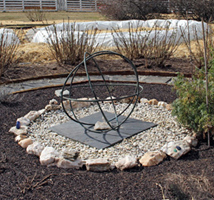 The center of the Perelandra garden is the focal point. 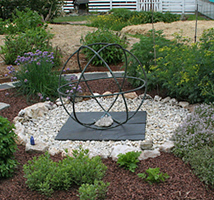 It is surrounded by a round band of buddleia bushes, a slate path encircling an herb band, and inside that, a circle of stones on which are placed certain minerals. Inside the mineral ring is a Genesa crystal. Everything that is a part of this center area is there because nature said it belongs as part of the balance of this garden. Do not try to replicate the Perelandra garden. Again: Don't try to replicate any part of the Perelandra garden. We're spotlighting the focal point because there might be more than plants, soil and fertilizer that are important to the balance of your garden. It could be minerals or gems, or an object that changes the balance of energy. Your garden focal point might be a bench or a folding lawn chair to remind you to take time to sit and enjoy your garden sometimes. Or it might include a sculpture. Or a waterfall. . . . As with choosing your plants and seeds carefully with nature, it's important to choose the other elements you add by asking nature what belongs. What, if anything, will add to the balance? Only test things you're truly willing to add. Don't bother asking if you are to build a gazebo next to your garden this year if you know there isn't a chance in hell that you're going to do that! Keep it simple and be respectful of your own timing regarding what you're drawn to and comfortable adding right now. 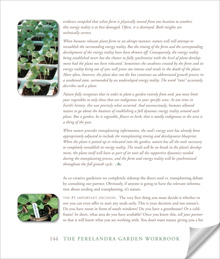 Read pages 137-141 of The Perelandra Garden Workbook, and then ask the questions. Trust your gut responses or use PKTT to find out if there is something beneficial to add to your garden. Go for it, you wonderful co-creative gardeners!